Integrated Systems & Machinery, LLC (INSYSMA) delivered specialized subsea Hydraulic Actuators for the US Navy under an 18 month supply contract. These actuators are an integral part of the Navy mission to maintain and modernize their submarine vessels. Project Management, Machining, Fabrication, Assembly & Testing was performed under contract. Machined & welded materials such as Monel K-500, Duplex Stainless Steel and other Nickel Copper (NiCu) Alloys were incorporated. Miniaturized valving from the Lee Company was incorporated into the hydraulic & lubrication scheme. Welding and NDT per MIL-STD-278(F) performed with certified test data sheets and weld procedures. Shop Acceptance Testing using an INSYSMA designed structural apparatus for proof testing. Integrated Systems & Machinery, LLC (INSYSMA) designed and supplied Lock Machinery for the Olmsted Locks Major Rehabilitation Effort (Miter Gate Hydraulic Cylinders, Culvert Valve Hydraulic Cylinders and Locking Mechanisms). This is currently the largest inland waterway project in the United States. Machining, Fabrication, Assembly & Testing was performed at >> Maritime Hydraulic Manufacturing Division in New Brunswick, Canada. A new Test Bench was fabricated to handle the required fluid volume and the number of units involved. The partners also oversaw the installation of the Machinery, wrote the Factory & Site Acceptance Test procedures, and worked with the Contractor to ensure risk free commissioning. INSYSMA will work with its clients to configure site specific hydraulic schematics, prime mover layout and instrumentation plan. We will optimize your pipe routing and ensure line sizing for flow, pressure and fluid velocity is within acceptable industry standards. Design consulting and creative ideas to maximize cost efficiency and drive value engineering is our forte. "The cylinders look really good. A lot of guys around here are happy with the coating system..." - Construction Representative, USACE"
Integrated Systems & Machinery, LLC (INSYSMA) analyzed, designed, fabricated and tested two unique large bore hydraulic cylinders along with their mated double-gimbals box. INSYSMA and Orbital ATK (OATK) engineering worked together to produce a high strength durable design to replace existing structures. 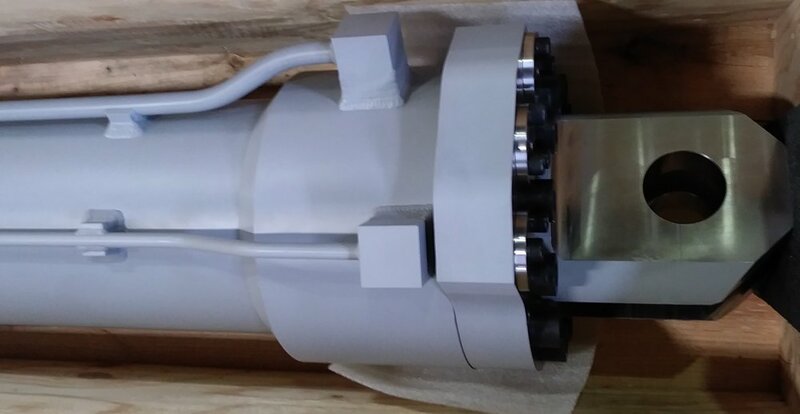 The design of the hydraulic cylinder was solely completed in-house. The challenge was to build an assembly that was 1.5x stronger with more lift capacity in the exact pre-existing footprint. The existing hydraulic system (previously installed by others) was analyzed via computational analysis modeling using Wolfram Alpha. This required thousands of hours of engineering, structural and system analysis as well as site visits to prove design and create viable upgrades. Careful attention was paid to the environmental impacts on corrosion and plume blast area. Several unique design features were employed such as including several weld claddings approved by a weld expert and metallurgist. Adherence to several industry standards such as ASME VIII BPVC, Air Force SPECMAN 91-710 and NASA STD 8719.17. A retrofit project presents many problems due to form, fit and function constraints that require a nuanced set of carefully planned & implemented solutions. We were happy to successfully perform above and beyond the scope of work to produce a quality product that will aid OATK in many future vehicle launches.